We have been discussing the fiduciary standard of care owed to investors for some time now — I am pro, much of the commission side of the business is con. 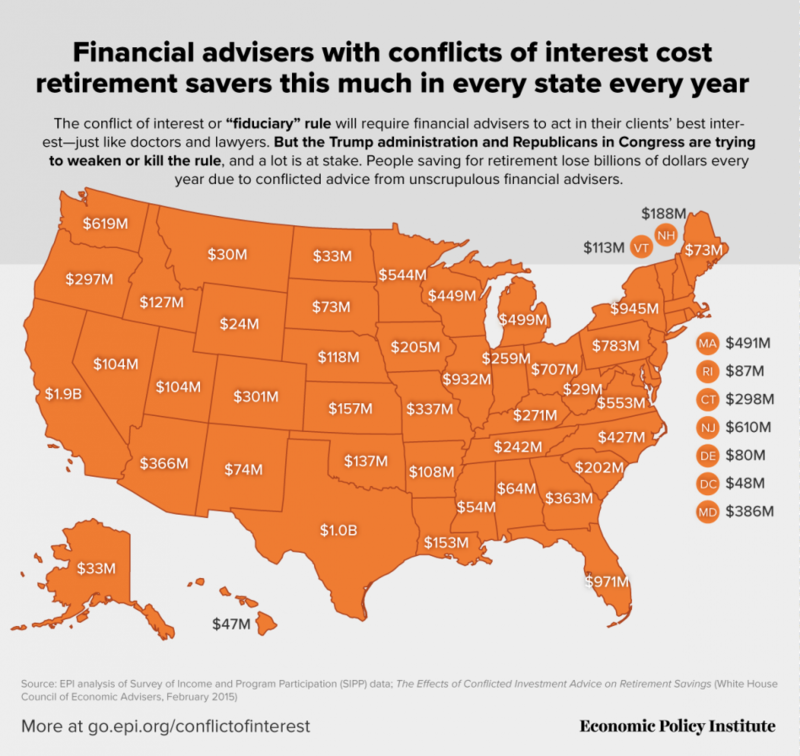 The map above shows how the cost of that conflicted advice — how much it costs retirement savers annually. The state by state breakdown of self-interested salesmanship — NOT ADVICE — simply works against the interest of both the saver and the taxpayer. Annual losses are as high as a billion dollars in Texas and New York and nearly $2 billion in California. Some estimates have the annual excess fee friction as high as $20 billion dollars nationally. Now compound that over 30 years, and imagine how big a shortfall that is going to create. Guess who is going to have make-up that giant gap? You the taxpayer are, that is who . . .
mirror The Fiduciary Standard is Coming! mirror Brits Debate Capping Retirement-Plan Fees, Should the USA? Fiscal Hawks Should Love Cheaper Retirement Plans (Bloomberg, February 24, 2015). mirror Attention Fiscal Conservatives: New IRA/401k Fiduciary Rules Will Reduce Future Taxes.